This box was designed by one of our customers Andrew Curry who regularly fishes reservoirs in the North East of England, particularly Kielder, Derwent, Fontburn and Grasholme Waters but these are expected to be successful on any large still water in England at most times of year. 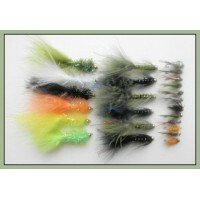 This is a fantastic selection for a beginner, lots of patterns to try out. 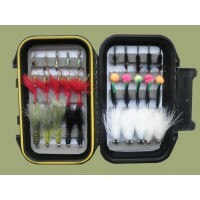 24 Gold Bead Lure and Nymph, Good cool weather selection on these sinkers - All Size 10 Ho..
40 summer trout flies in our water tight fly box. 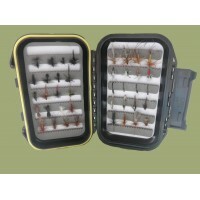 A great collection containing a selection from the..
40 Autumn trout flies in our water tight fly box. 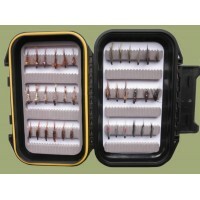 A great collection containing a selection from the.. This box was designed by one of our customers Pat Mullen, who regularly fishes small brown trout in .. 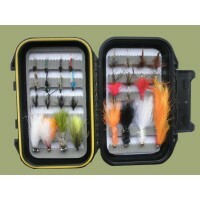 This box was designed by one of our customers Michael Edwards who is a 'Reel Friends' member and a F.. 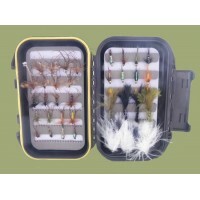 This box was designed by one of our customers Andrew Curry who regularly fishes reservoirs in the No.. 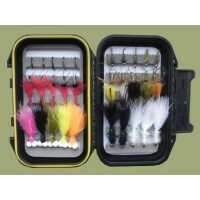 This box was designed by one of our customers Richard Borgust, who enjoys fishing during late aftern..